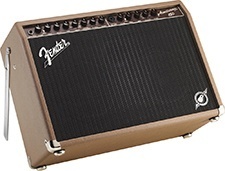 When it comes to guitars and guitar amplification, there is arguably no manufacturer more iconic than the Fender Company. For years guitarists have relied on both Fender guitars and Fender amplifiers to get the job done; in rehearsal spaces, recording studios and live arenas. And with Fender’s introduction of the ‘Acoustasonic’ acoustic guitar amp line, playing acoustic guitar in a live environment has become a whole lot easier and a heck of a lot more enjoyable. 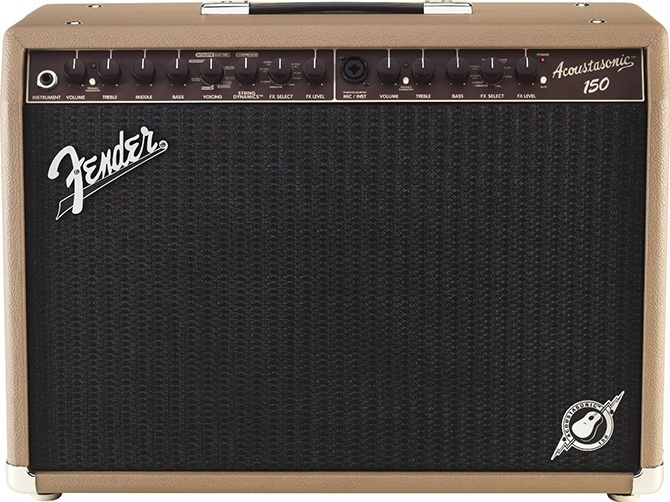 Fender’s latest offering in its Acoustasonic line, the Fender Acoustasonic 150 Combo amp packs some pretty powerful and diverse amplification options into one rugged package. At 22’’ wide, 16’’ high and 10’’ deep, the Fender Acoustasonic 150 is not a bulky amp by any means. And with its lightweight plywood body and total weight of just 22 pounds, it’s an extremely road-worthy addition to any acoustic guitarist’s rig. The Acoustasonic 150’s unique sound is delivered via two 8” foam-surround low-frequency neodymium drivers. It also comes equipped with a high frequency tweeter that helps deliver a clean, well-rounded and powerful sound. 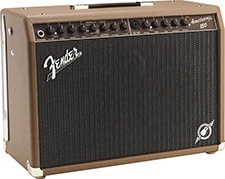 Fender has also retained an early 60’s Fender look for the amp with a tan tolex covering, brown control panel, brown control knobs with white pointers and black grill cloth. The amp’s metal tilt-back legs also add a classic touch to the amp and also enable much better projection. But don’t let this amp’s timeless look fool you. Underneath the classic vinyl is a powerful amp that delivers some pretty unique features. The Acoustasonic 150’s control panel layout is deceptively simple. The amp has two main channels – a main 1/4-inch instrument input channel on the left and a combined ¼-inch/XLR jack with phantom power on the right channel. The main instrument channel comes equipped with volume, tri-band equalizer, voicing, string dynamics, effects type and effects level control knobs and a feedback-elimination button. The controls for the right hand channel are similar except they only include EQ controls for bass and treble and no voicing and string dynamic controls. The right hand channel also has a mute button which bypasses the sound of the amp, which can be extremely useful in a live setting when a guitarist needs to tune up or change guitars. The amp’s rear panel is armed with a standard power switch, XLR output with adjustable level controls, and a stereo effects loop. Another unique and very useful feature of this amp is its USB port for computer connectivity which can make life much easier for guitarists that do a lot of direct recordings. One tiny con that we think begs mentioning at this point is that Fender seems to have done away with the auxiliary input RCA jack on the Acoustasonic 150. While this is not a huge drawback, especially for an amp with such a diverse array of connectivity options, this does mean that more old-school guitarists won’t be able to hook up their amps to a CD or MP3 player. One of the most innovative features that Fender has introduced with this amp is its voicing control which allows players to digitally model their sound based on various guitar body types. This voicing control allows players to digitally model their sound into a parlour, dreadnought or jumbo bodied guitar’s sound. And while this feature isn’t likely to fool an acoustic guitar aficionado’s ear, it does do a commendable job of digitally altering a guitar’s natural tone. And while the uses of this function might not seem all that valuable to the amateur guitarist it can be quite useful for players that perform constantly with a wide selection of guitars, negating the need to travel with an excessive amount of instruments. The voicing function also offers acoustic guitarists that occasionally play electric guitars the ability to digitally model their electric guitar sounds to Blackface, Tweed and British amplifier settings. The Blackface delivers a crisp and clear sound that is almost suggestive of a classic 1960’s Fender combo, while the British setting delivers the smooth, warm distortion of a Marshall stack. This versatility of digitally creating tones negates the need for acoustic players to carry a second amp just for electric playing. However, a minor drawback with the voicing settings is that they can’t be changed with a footswitch and can only be changed manually, which can sometimes be a hassle in a live gig environment. The Fender Acoustasonic 150 offers players an impressive array of high-quality digital effects including vibrato, chorus, reverb and delay. These effects can be used both independently and paired in various combinations. The Acoustasonic 150 also comes with an extremely useful string dynamics feature that acts as a compressor to smoothen out high notes that peak too harshly. A minor drawback with the amp’s effects is that it only offers the players the option to change the level of effects. For example, when using the delay effect, a player could adjust the intensity of the delay but would not be able to set a specific tempo for the effect to be in sync with the speed of a specific song. However, since players have the option of hooking up an external effects system to the amp, this shouldn’t pose that huge of an issue. This high quality, durable footswitch is a must have for any serious owner of the Acoustasonic 150. The footswitch enables players to switch between the amp’s many effects easily and smoothly, and is a useful addition to a guitarist’s live rig. The Acoustasonic 150 might be a durable amp able to withstand even the most rugged road treatment, but that doesn’t mean that a guitarist shouldn’t make sure that it travels well. The Fender Acoustic Junior DSP Cover is the perfect road accompaniment for the Acoustasonic 150 and a must for any touring owner. In conclusion, the Fender Acoustasonic 150 is versatile and innovative, and includes nearly everything that a serious acoustic guitarist could ever need: powerful amplification, a diverse array of effects, and an ease of use that is virtually unmatched. 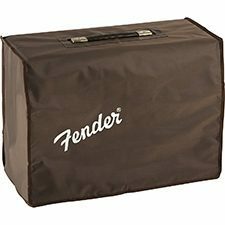 If you have any experience with the Fender Acoustasonic 150 please feel free to leave a comment below and tell us your story.